For the second year in a row on Holy Thursday, Broadway Fillmore Alive has put together a self-guided tour of seven historic Catholic churches in the Broadway-Fillmore area partaking in the traditional visitation of the of “Seven Churches” beginning at St. Clare’s. 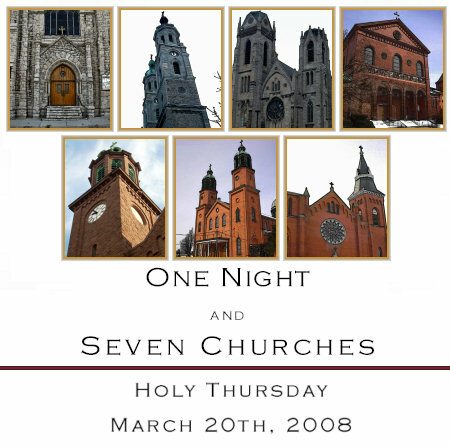 The tradition of visiting seven churches on Holy Thursday is an ancient practice, originating in Rome and is a custom of Polish and Italian Catholics. Buffalo’s Historic Polonia District comes alive on this night as many make a pilgrimage to various churches on the East Side. It is equally a religious and cultural experience as people get to view the churches in a unique setting commemorating the Last Supper of Jesus during Holy Week. Broadway Fillmore Alive has put together this tour as a way to expose more people to the beauty and historic relevance of Polonia’s incredible churches. You don’t have to follow the order we selected, but be mindful that Holy Thursday Mass may still be taking place in many churches.